Raised circular surface also prevents slips. Conforms to slip resistance test R10. Large holes allow fall through of debris. Ensuring employees are comfortable while working is highly important, especially when they are working on their feet all day, as it is easier for them to feel fatigued and cause strain to their bodies. Our Anti-fatigue mats will help combat these issues and keep your employees alert all the working day, reducing the strain standing up all day can cause on a workers body. 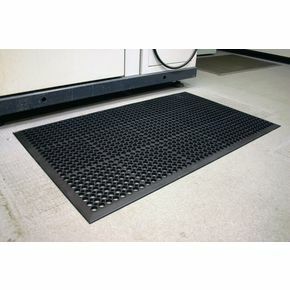 They are made from hard wearing rubber and have holes which allow liquids that fall on the mat to drain and debris to fall through, helping to minimise the risk of slips. The raised circular surface also adds superior slip resistance, creating a safe surface for your employees to use while working and it conforms to slip resistant test R10. These mats are available in a choice of two dimensions; 800mm x 1200mm or 900mm x 1500mm and they have bevelled edges which prevent trips. Overall our anti-fatigue mats will help to create a safe and more comfortable working environment for your employees; they also come with FREE UK Delivery.